Reentry heat shields on these vehicles are often proposed to be some sort of ceramic and/or carbon-carbon heat shields, or occasionally metallic heat shields (possibly using water cooling or some sort of relatively exotic rare earth metal.) Ablative heat shields offer light weight, but are not reusable. 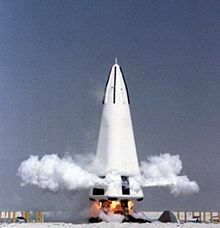 Other launch system configuration designs are possible such as horizontal launch with vertical landing (HTVL) and vertical launch with horizontal landing (VTHL). One of the few HTVL vehicles is the 1960s concept spacecraft Hyperion SSTO, designed by Philip Bono. X-20 Dyna-Soar is an early example of a VTHL design, while the HL-20 and X-34 are examples from the 1990s. As of February 2010[update], the VTHL X-37 has completed initial development and flown an initial classified orbital mission of over seven months duration. Currently proposed VTHL manned spaceplanes include the Dream Chaser and Prometheus, both circa 2010 concept spaceplanes proposed to NASA under the CCDev program. 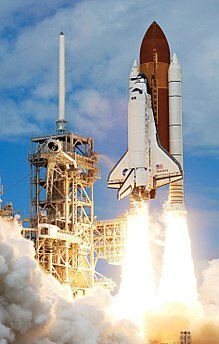 This page is based on the Wikipedia article Reusable launch system; it is used under the Creative Commons Attribution-ShareAlike 3.0 Unported License (CC-BY-SA). You may redistribute it, verbatim or modified, providing that you comply with the terms of the CC-BY-SA.